Worship is one of the three pillars on which the FVJC community rests. 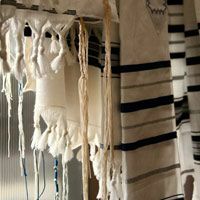 Whether on Shabbat, the High Holy Days, festivals or special services, you will find prayer to be a significant part of our kehillah (community). The structure of our prayer service encourages communal involvement and sharing, which enables us to expand our sense of self within community. In this way we prepare ourselves to connect not only with God but also with each other. We strive to create prayer experiences that are meaningful, inspiring, engaging and accessible to all. Recognizing that not all members are fluent in Hebrew, we provide transliterations wherever possible, sing nigunim (melodies without words) and learn new music together, as a holy family. We aim to create prayer that serves as a pathway to Emek Shalom, a valley of peace. We welcome families with young children to take part in FVJC Shabbat experiences in any way that feels comfortable for you. We aim to provide a child-friendly worship environment for all families. Feel free to join us in PJs for an easy transition home.